God forbid that you should ever be charged with a capital crime, but if you were, won’t you consider yourself blessed to be represented by a lawyer who has never lost a case? 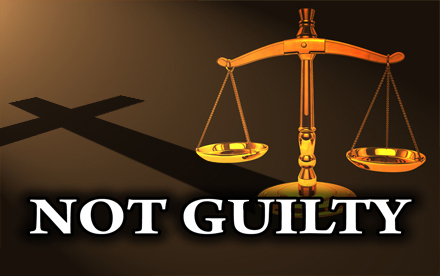 Having a lawyer with such superior legal experience and knowledge of what it takes to obtain a “Not Guilty” verdict would be the best thing that could happen to you. It would be highly advantageous for you, instead of you trying to defend yourself, to let such a representative speak on your behalf. But because of His great love for us, His commitment to justice, and His desire that we be represented by the best, our Heavenly Father appointed none other than His Beloved Son, the Lord Jesus, to be our Savior and Advocate before His Throne. Listen to these wonderful words from Scripture. What an Advocate He is! He obtains a “Not Guilty!” for everyone He represents. He never loses a case. Who is representing you before God? Are you trying to speak for yourself, or are you letting Jesus speak for you? He stands ready to plead your case, if you will only put your faith in Him. I will Bishop, God bless you Sir. Lord Jesus thank you for being our advocator. Good morning Bishop, I pray all is well with you and the family and not forgetting those families who have been hard hit today by Sandy. I thank God that I have a lawyer who will never appeal a case since he has never and can/will never loose a case, a lawyer whose professional fees is free of charge, it only takes faith in him to pay for his professional services. Thank you ! pour ces puissants messages tout le temps qui béni nos vies .Que le seigneur Dieu élargit tous les jours votre ministère ,Alléluia !! !